Fonterra’s Global Dairy Trade for dairy products saw prices drop by 0.3% in the latest auction, which took place today (Tuesday). The fall comes on the back of an a slight rise of 1.4% in prices at the last auction in mid-October. Today’s, fall was driven by a 9.0% decline in the auction index for Chedder, although prices for all products across all contracts did not decline from the previous auction. With Whole Milk Powder (WMP) prices up marginally. The average price for all products across all contracts now stands at US$2,599/tonne. 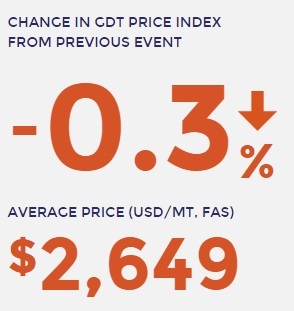 The gDT TWI index fell by o.3% compared to the previous auction. The average weighted butter price was down 4.1% from the last auction, at $2,505/tonne. WMP averaged $2,522/tonne across all contracts, a increase of 1.6% on the last auction. The weighted SMP price was down 1.2% from the previous auction, at $2,457/tonne. The price for Cheddar was down 9% on the last auction, at $2,728/tonne.